Our Evaluation methods not only include internal assessments, group discussions and theory examinations but also assess the Guna (Tamas, Rajas and Sattva) Scores of each of our trainees. We measure the Guna Scores at the beginning and at the end of each course to assess the students' holistic growth. Ajarya has yoga experts as Advisors on its Board of Advisors. Ajarya has a structured Board of Studies and an Academic Council. All programs have a Lead Trainer and a separate team of teachers to conduct the courses. Ajarya regularly recycles any content which is redundant on its website including any older Faculty. Ajarya Adjunct Faculty is readily available on-call to teach specialisation subjects for all its courses. Ideally, all our venues have in-house food and stay facilities. We have single and double bedded rooms to individuals and couplese too . The classes are held inside the same campus as stay and the food. Healthy, non-vegan, sattvic food is served for Breakfast, Lunch and Dinner. Fresh Yoghurt is served for Breakfast and as part of the weekly Menu for Lunch. Fresh Fruits and Vegetables are freshly cut only 30 minutes before consumption. Housekeeping is done compulsorily every three days or any time on demand. Kitchen vessels are chlorinated every two weeks. There are two yoga studios that look out in to the nature on both sides. The venue also has a green lawn and a sit out where campfires could be burned during winter. Ajarya has an active alumni program. In its two years of training, most graduates are practising and teaching yoga in different parts of the world. The progression of our teachers is given below in the Progression Plan. Ajarya has showcased many distinct activities and projects through its websites. Ajarya allows its Alumni and the worldwide yoga community to participate freely in the development of its website. We at Ajarya are focused in helping you grow in the path you have chosen, rather than this being just a one-off experience. CE - Continuing Education Opportunities through Diversified Yoga Programs that AYA will be launching. This will give you a life-time experience of sharpening your skills and further your learning with diversity. 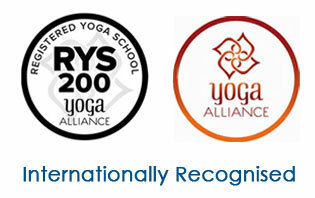 Ajarya has exclusive tie ups with leading Yoga networks. As a special advantage to Ajarya Students, the Ajarya Outreach program will help you get students from your area - a crucial marketing aspect to help your yoga practice take off.